COMMUNITY / Mobius / Forwarding bet.. I have a query about "https support" when a forwarding of the request happens between CSEs in different SP domains. 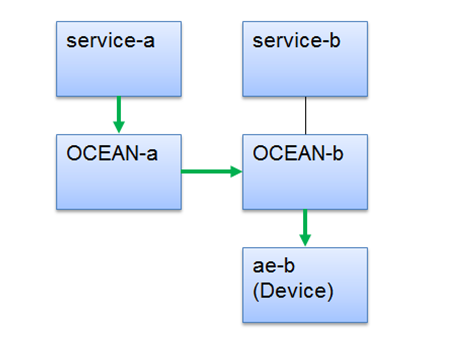 Domain for IN-CSE OCEAN-a/OCEAN-b are set to different domain, e.g. sample.a/sample.b respectively. <remoteCSE> of CSE-Base of OCEAN-b (e.g. mb-base-b) has been created under CSE-Base resource of OCEAN-a (mb-base-a). When I tries to access the ae-b resource from service-a vi OCEAN-a/OCEAN-b like above, I got the following error. When I checked the source code, I found the check_csr() function ( in app.js file ) that forwarding the request to POA (OCEAN-b in this case) only supports http and mqtt but not https. I think the URIs included in the poa list should be started from "https://" but still not sure if current version supports this kind of forwarding using https. Could you please let me know if I am wrong?